● The steering wheel may be locked. ● Try to turn the steering wheel left and right while turning the ignition key. I cannot remove the key. The shift lever should be moved to . 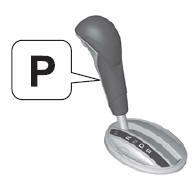 Why does the brake pedal pulsate slightly when applying the brakes? This can occur when the ABS activates, and does not indicate a problem. Apply firm, steady pressure on the brake pedal. Never pump the brake pedal. The rear door cannot be opened from inside the vehicle. Why? Check if the childproof lock is in the lock position. If so, open the rear door with the outside door handle. To cancel this function, push the lever to the unlock position. Why do the doors lock after I unlocked the doors using a remote transmitter? If you do not open the doors within 30 seconds, the doors are relocked automatically for security. Why does the beeper sound when I open the driver’s door? The beeper sounds when: ● The key is left in the ignition switch. ● The exterior lights are left on. Why does the beeper sound when I start driving? The beeper sounds when: ● Driver and/or front passenger are not wearing their seat belts. ● The parking brake lever is not fully released. Why do I hear a screeching sound when I apply the brake pedal? The brake pads may need to be replaced. Have your vehicle inspected by a dealer. : This product contains or emits chemicals known to the state of California to cause cancer and birth defects or other reproductive harm. This vehicle is equipped with an event data recorder (EDR). • How far (if at all) the driver was depressing the accelerator and/or brake pedal; and, • How fast the vehicle was traveling. These data can help provide a better understanding of the circumstances in which crashes and injuries occur. NOTE: EDR data are recorded by your vehicle only if a non-trivial crash situation occurs; no data are recorded by the EDR under normal driving conditions and no personal data (e.g., name, gender, age, and crash location) are recorded. However, other parties, such as law enforcement, could combine the EDR data with the type of personally identifying data routinely acquired during a crash investigation. To read data recorded by an EDR, special equipment is required, and access to the vehicle or the EDR is needed. In addition to the vehicle manufacturer, other parties, such as law enforcement, that have the special equipment, can read the information if they have access to the vehicle or the EDR. The data belongs to the vehicle owner and may not be accessed by anyone else except as legally required or with the permission of the vehicle owner. This vehicle is equipped with service-related devices that record information about powertrain performance. The data can be used to verify emissions law requirements and/or help technicians diagnose and solve service problems. It may also be combined with data from other sources for research purposes, but it remains confidential. symbol. This information is intended to help you avoid damage to your vehicle, other property, or the environment. one of three signal words: DANGER, WARNING, or CAUTION. HURT if you don't follow instructions. - such as Important Safety Precautions. - such as Safe Driving. - how to use this vehicle correctly and safely.